Hi matt and thank u for your answer. That is exactly what I was looking for, thank u very much!! And thank u again for the ‘‘itkSoftwareGuide’’, it is saving me so much! Hi @matt.mccormick and sorry to bother u! I’ve got this problem… why, in the segmented image, is it gray in the background instead of black? Note: before segmentation, I changed the pixel type of the original image from ‘signed short’ to ‘float’ and I rescaled it between 0 and 1… is this actually affecting the MaskImageFilter? One last thing… the intensity of the pixel in the ‘segmented image’ look different from the ‘Input image’, why? Should I care? Should I not perform rescaling? Thanks in advance for your precious help! We usually just rescale outputs to make it easier for visualization tools. Many visualization tools just support unsigned char pixel types, which means a range of values from 0 to 255, and they do not support dynamically adjusting the window / level, i.e. how values are mapped to colors. The color black is dependent on the color mapping settings of the visualization tool. Many tools we work with for image analysis support multiple pixel types and dynamically adjusting the window / level. “Black” in CT is -1000, not zero. Zero is water, which appears gray. You should set -1000 as OutsideValue in MaskImageFilter. 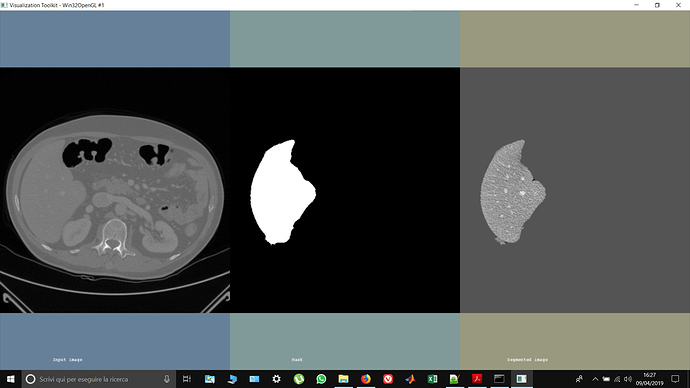 Maybe i should have been more precisely from the beginning…i have 199 dicom images (CT), from which i segmented the liver (but first i converted the pixel type from ‘signed short’ to ‘float’ and rescaled it between 0 and 1). 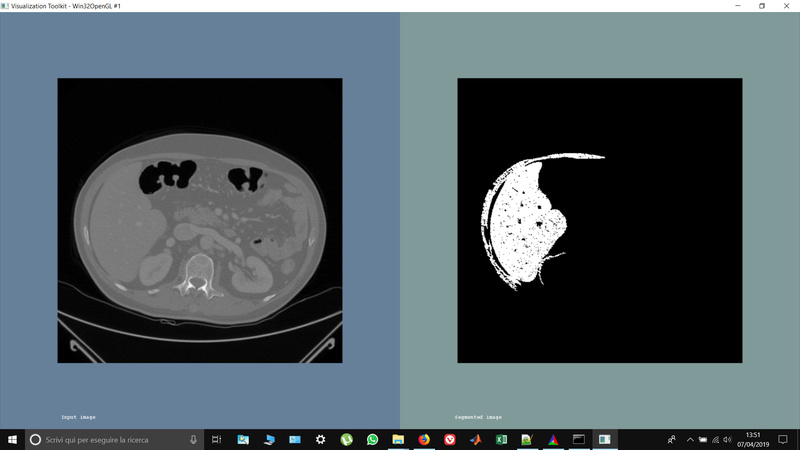 Now it is mandatory for my project to save the 3d volume of only the segmented liver in 199 dicom images… i symply use a CastFilter from ‘float’ to ‘signed short’ and use the example i found in "DicomSeriesReadSeriesWrite.cxx’’ to first read the series in a volume and then write the volume of the segmented liver in a serie of images… should i rescale first the images in the original range before re-casting? Does this anything to do with the fact that i dont have ‘0’ in the background as i want?? Thank u very much for your help! I am also looking at segmenting the liver from CT images. I am interested in automatic techniques. I would be willing to share my best approach with you. Are you performing any preprocessing of your CT images to remove noise? Is your approach manual, semi-automatic, or fully automatic? How did you set your seed points? Can you share your ITK prototype source code? If I achieve decent results on any single stage then I will share them.